There are two things that I never tire of shopping for and those things are jewelry and home decor. In both cases, I always tend to gravitate toward the most unique items, for I really want to make a statement with the way my home looks as well as with my own appearance. 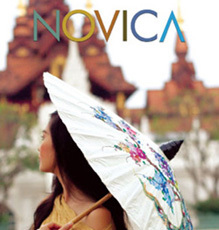 NOVICA wants to indulge everyone's quest for the unique and they have combed the world to find skilled artisans specializing in handmade jewelry, hand carved furniture and unique gifts. Their selection of jewelry and fine furnishings for the home was so immense, that I shopped online for over two hours, but finally chose the following two items to show you! Both of the items I discovered on the NOVICA site are absolutely stunning in both their originality and detail. If you're a jewelry lover like me, then I guarantee you'll love the amazing Woven Elegance sterling silver ring: I came to find out that this beautiful ring is created by a lady named, Made Sriasih, from Indonesia. Her father was an expert silversmith and he passed his training on to her. I also discovered that the following chess set was handcrafted by a man named, Khyali Ram, from India. The neat thing about the NOVICA website is that you can actually search their extensive selection by these artisans. So, if you've really fallen in love with the products made by a specific artisan, it's easy to find more items from that person! They also feature short videos about each artisan, so you can learn more about where your unique piece came from. What I love about the Woven Elegance ring, is that I've never seen anything like it before, so it will be an instant conversational piece. Also, it is such a timeless design! I could wear this ring with absolutely any outfit and it would look perfect. I really was astounded at the quality and the intricacy of the design and will definitely be purchasing more jewelry from NOVICA. Like I said, it took me a few HOURS just to decide on this because there were so many pieces I wanted! 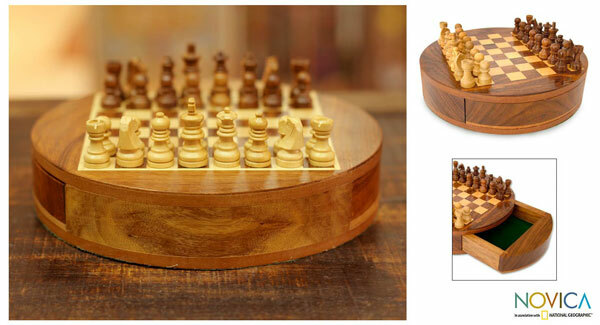 The small Circle chess set is perfect for virtually any room in your home. I love playing chess, but didn't want to have a large, cumbersome board for the game room, since we don't really have the space for it. I wanted this chess set to be as much a decorative piece as it would be functional, and NOVICA had just what I was looking for. This wooden circle chess set is completely hand carved and absolutely beautiful! The tiny pieces actually have magnets inside them so that they adhere to the board without falling off. The neat thing though, is that the magnets in both the pieces and the board are completely hidden, so that the beauty of the set is not diminished by them. There is even a felt-lined drawer which pushes out so that the chess pieces can be stored, if you want. I love how the drawer doesn't have a handle or any other protuberance that would ruin the overall circle design of this set. I couldn't be more pleased with NOVICA.com. They have such an extensive selection of chess gifts, unique gifts for men and gifts for the executive from all around the world, which is sure to please anyone! I have several friends and family that are pretty tough to buy for, but I think that with NOVICA, those problems have been solved. Take a look for yourself and see if you agree! Also, NOVICA has a brand new feature to their site which I highly recommend you check out. It's the new NOVICA curation effort - a feature that lets everyone create their own curated collections of products, with the option to add mood shots from their ever growing image library. WARNING: It's like Pinterest, only more responsive (and addictive), and all for a great cause! Disclosure: I received a $75 gift certificate from NOVICA United, Inc. in order to facilitate my review. No other compensation was received. This product review is based on my own personal experiences with this item and is completely honest and objective. I love the flowers dipped in gold and then painted. The garnet colored gold dipped orchid is stunning! I love the Beaded waterfall earrings called Falling Rain! I would love to have the Garnet and pearl dangle earrings, ‘Forest Princess’. I like the Azure Teardrops earrings. The Ethereal Choker is gorgeous! I love the amethyst dangle earrings. I’d love to get the Serpentine long eco-necklace, ‘Story of Hope’. I’d love to have the Cotton scarf, ‘Village Fair’ ! I like the Silver and leather pendant necklace, ‘Little Boy Angel’ – very pretty! I would love the Beaded dangle earrings, ‘Thai Roses’,just my style and love the color. I would love to have the Cotton hammock, ‘Night and Day’. I’d like to have their Quartz dangle earrings – Royal Elegance. I would love to win this gift certificate so I could get the chess set for my 11 year old son.He used to play chess with his daddy but he passed away last fall so now he’s teaching me how to play. I’d love to get the ‘Turquoise Sonata’ hammock. It looks so cumfy! I really like their wooden sugar bowl. They have so many choices it’s hard to choose!